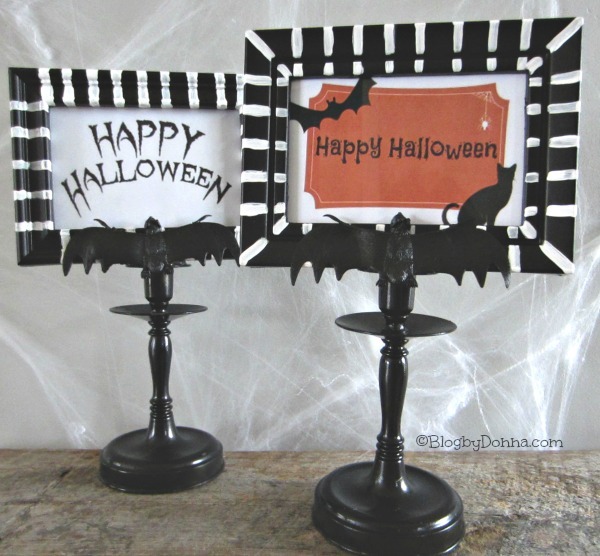 If you’re looking for a last minute Halloween craft idea, these easy DIY Halloween candlestick frames are easy and cheap. If you’re like me and don’t want to spend a lot of money on something you put out for approximately a month a year, these frames are it. You can use them year after year and it’s a fun DIY Halloween project to do with your kids, too. Spray paint candlesticks. It may take 3 or 4 coats to cover all the areas. While candlesticks are drying, paint white stripes along the border of your picture frames. After all paint has dried, apply a couple of decent sized drops of hot glue. Center the frame on your glue drops and hold in place for about 10 seconds until glue cools completely. Apply generous amount of hot glue to the back of the bat, place in desired position on frame. Hold into place for about 10 seconds until the glue cools completely. Clean up any glue strings that are visible and add your photo to frame! Do you like to do DIY Halloween crafts? This is a great craft idea. My daughter would love it! Those are super cute and festive. I’ll be trying my hand at making them for Halloween next year. These are so cute, a nice decoration I could use every year. Yes, I love doing crafts for any season. I wish I had more time for it though. These are super cute! This is so cute, I think I may incorporate this in my party on Friday. Love the colors! Too funny that you used plastic bat toys. Very clever craft and it seems to be an idea that can be used for many other occasions as well. What a festive and cute craft! You’re so clever — I would not have ever thought of doing something like this. I’m so uncrafty lol. Very cute! So perfect for Halloween! Those are adorable and so easy to make for Halloween. Oh those turned out too cute! I like how simple they seem to be to make! These turned out very cute. I could also see them as a fun centerpiece or name card for Halloween party food. Those are really cute! I love crafts in general and wish I had more time to devote to them. This could be used for other occasions also. Thanks for sharing.